What can I say? THE greatest electronic band of all time! Even better than Kraftwerk or Underworld - and that's some seriously stiff competition. Don't bother to argue though, it's purely subjective. Pretty much the entire New Order and Joy Division back catalogue can be found here, but as far I can see they don't have this up. 5-8-6 was recorded for the 1982 opening of Manchester's Hacienda, apparently it originally came in at 22 minutes, but thankfully they shortened it for the album release. These 2001 Peter Black remixes keep it sparse and deep, and the fantastic dub dispenses with the vocal altogether to accentuate the grinding bassline. Perfect 5am munt music. 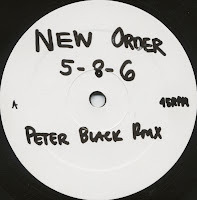 Apart from Shep Pettibone and Arthur Baker (who helped define their sound back in the early 80s), very few remixers have done New Order real justice. But Peter Black gets them, and gets them good. It's amusing that all three of these guys are American and isolated from the English Acid House scene, but get it more than anyone who was part of it. thanks. yes, dub is best - not very often I rate a New Order instrumental higher than one with a Bernard vocal either. I was standing next to Doc Martin as Space in Ibiza when he dropped this track in the summer of 2001, I could say every major dj that was there that night was running to the booth to see what it was, also the Hacker played the vocal mix for the record release party for Get Ready in France , the A&R guy was asking him where did he get this remix.